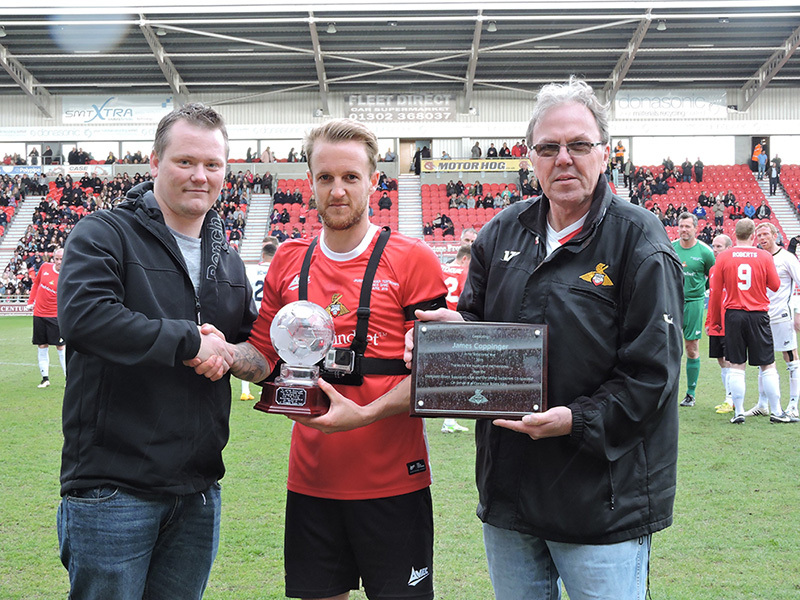 The Doncaster Rovers Supporters Club and Viking Supporters Co-operative joined together to celebrate James Coppinger's testimonial year last weekend. On the pitch at the legends game Rob Williams from the VSC and Len South from the Supporters Club presented him with a Special Trophy and Plaque, which will be on display for years to come in the Belle Vue Bar. Needless to say it's a small token of the fans appreciation for such a dedicated player, and we're sure you'd join us in saying Copps truly is a Rovers legend. We also clubbed together for a Coppinger "LEGEND" flag, which we can't wait to see in the South Stand from next season along with the flags and banners of the Black Bank movement.